Fairmont St Andrews boasts two outstanding links courses perched upon the cliffs above St Andrews Bay, which have been widely recognised as a fantastic addition to the historic courses already found at St Andrews Links. Both courses are links in style but have been built to suit the demands of a top-class resort, playable for golfers of all standards, with a variety of tees from which to choose. Found on Scotland’s dramatic east coast, the Fairmont is an hour and a half from Edinburgh by car, but just ten minutes from both St Andrews Links and the world-famous Kingsbarns. The hotel at Fairmont St Andrews is a fabulous 5-star establishment, looking out over the two golf courses guests can relax in comfort and style. As well as a host of great facilities including The St Andrews Spa, you will have easy access to St Andrews town, just ten minutes away. Former Ryder Cup captain Sam Torrance has put his hand to this par-72 layout which now tips the scale at more than 7,200 yards from the championship markers. As the venue of not only Final Qualifying for the Open Championship but also for the Scottish Seniors Open, the Torrance is a course which is sure to test all levels of golfers. Following a recent multi-million pound refurbishment in 2009, involving re-designing eight holes and rebuilding all 63 bunkers, the Torrance is now one of Scotland’s most dramatic and challenging courses. A new irrigation system and major drainage works have made the course playable in all but the worst of weathers. The dramatic cliff top course, which overlooks the Old Grey Toon of St Andrews, is protected not only by length, but also by strategically placed bunkers which will snare any misplaced approaches. This is most obviously seen on the par 5’s, where those not able to go for the green in two will be faced with some tough questions as to where to leave their approach to the green. With three of the finest finishing holes in Scotland, those finishing with a flourish are sure to reap the rewards of dramatic vistas offered on 16 and 17, while the long climb up to the par 5 18th offers a good birdie opportunity if the wind is helping. The Torrance course certainly acts as a great ambassador to the home of golf. The 17th is a stunning golf hole, with a testing tee shot. Down the entire right hand side of the hole, the out of bounds runs parallel with the coastal trail, before sharply cutting across the front of the green. Golfers should also take caution of the left, where there is a lot of rough. The green itself is guarded by bunkers and with the prevailing wind; the approach is fraught with anticipation of the final score. Originally designed by Bruce Devlin, The Kittocks, originally known as the Devlin Course, is arguably the prettier of the two courses at Fairmont St Andrews and while many expect an easier challenge than that found on the Torrance Course; the par-72 layout stretches to more than 7,100 yards and is sited on elevated grounds next to the cliff tops, leaving little margin for error. Devlin’s design is well thought out too and the natural features of the land are used to great effect. Amongst his design is a deep ravine called Kittocks Den, which cuts playfully throughout. As the course meanders along the rugged Fife coastline it sparks into visual life on the back nine with approaches into the 15th framed by the sea, while 16 and 17 are perfectly placed along this beautiful stretch of shore with views towards the famous town of St Andrews. On a sunny day, there are few better places to play a round of golf. The par four 15th hole is the highlight of the Kittocks course. At 462 yards off the blue tees, it is easy to see why this hole deserves its status of stroke index 4. The hole doglegs left towards the hanging cliff edge green, making for a dramatic approach shot. The redesigned green sits above the site of a 2000 year old Iron Age fort. Practice targets, an extensive short game area and a large putting green are all on hand, in order to prepare you for your round. Practice balls are available at £5.00 per bucket of 50 balls. The clubhouse provides a relaxing conclusion to your round, with stunning views overlooking the town of St Andrews and The Eden Estuary. The menu offers golfers favourites as well as authentic local dishes. The clubhouse is also easily adaptable with its open-plan design, and provides an excellent facility for prize presentations and receptions. Dress code in the clubhouse is resort casual, whilst for those wishing to drink and dine the dress code is relaxed smart casual and a jacket and tie are not required. Farrington’s pro shop is located within the clubhouse. It offers a variety of merchandise with branded clothing from Adidas, Tommy Hilfiger, Lyle & Scott and Underarmour as well as golfing accessories. During the winter, the shop is open from 08:00 to 16:00, whilst summer hours run from 06:00 to 18:00. PGA Golf Instruction is also available at Fairmont, and can be arranged to focus on all aspects of the golf swing, the short game and course strategy. After booking rounds at Torrance or Kittocks, the Fairmont team would be pleased to assist in booking rounds at some of the local courses nearby. This includes the famous Old Course, as well as the Kingsbarns Golf Links and The Castle Course, which are all within 10 minutes of Fairmont. Sitting proudly above its two fabulous golf courses, and facing back towards the famous St Andrews skyline, the hotel at Fairmont St Andrews is a true 5* venue. Each one of the 209 well-appointed bedrooms ensures that its occupants relax in comfort and style, while the facilities throughout the hotel cater for any desire. A top quality conference and banquet host, the team of staff at Fairmont prides itself on its unwavering commitment to customer service. In addition to the main hotel rooms, the Manor Homes offer modern open plan design, and are situated next to the 4th fairway of the Torrance Course, sharing the same breathtaking views as the resort. Each Manor Home has four large en-suite bedrooms, a farmhouse style kitchen, luxurious living room, dining room and a fully equipped business office. The Squire bistro offers a relaxed and hospitable dining experience. For afternoon tea or a light snack, try Kittock's Den or the Clubhouse, which overlooks the resort grounds and affords panoramic views across the bay and out to sea. The hotel also offers a European-style health spa with full range of body and beauty treatments, including Swedish massage, deep cleansing facial, hydrotherapy bath, paraffin wrap, salt glow with Vichy shower massage, and thalasso therapy exfoliation. There are also fitness and wellbeing activities, steam rooms, sauna and jacuzzi, not to mention a large heated indoor swimming pool. Eat at The Seafood Restaurant, perched above St Andrews' West Sands. Drink and play darts in The Jigger Inn, attached to The Old Course Hotel. Visit St Andrews historic castle and cathedral ruins. From driving in through the well manicured entrance you are made to feel as if you belong, a welcoming atmosphere from everyone over the course of our too brief a stay, the room was clean, well furnished and spacious, the beds are extremely comfortable and the quiet is deafening. The breakfast choice is extensive, well presented & prepared. Overall it is one of the the most pleasant places to play & stay I have encountered. Hotel was great. Excellent service. Bar area a little pricey but to be expected at such a great hotel. We played the Kittocks course when our golf society visited St Andrews for our 10 year anniversary tour. I was lucky enough to play the Torrance Course a few years back and, in general, found the Kittocks to be more scenic, but a little easier as it’s slightly more open. Overall we found that the higher handicaps in the group scored better on the day, but everyone came off the course nicely surprised as to how good it was. We must give a special shout out to the guys in the proshop who were extremely helpful, even going so far as to give us all a miniature bottle of whisky to keep us going for the round! This grand hotel is located a little outside St Andrews and offers amazing views down towards the town itself. The courses are a links style but very modern so not really a bump and run type of course. Has a few holes down towards the sea which are spectacular. The clubhouse is a really nice place to sit and have a drink after golf with views across the sea but the hotel doesn't really have any views so you are probably best heading into town for a drink in and around the Old Course (No 1 golf place or The Dunvegan). Would stay and play here again, we thought the deal was great value for money. I scored well on the Old Course with a par on the road hole; what more can you ask for?! Thank you for everything yourgolftravel did for me and my mates. The golf trip to Scotland was great! It was a bit windy but thankfully dry and that was a bonus for this time of the year! I scored well on the Old Course with a par on the road hole; what more can you ask for?! The Fairmont St Andrews Hotel was really nice with very nice rooms and very pleasant staff. Again many, many thanks for a very enjoyable, trouble free golf trip. We thoroughly enjoyed our trip to The Fairmont St Andrews, which we combined with a golf lesson from a local Pro using the Trackman device, which we found extremely interesting and also quite soul destroying! The two golf courses at The Fairmont – Torrance and Kittocks – were both in great condition for this time of year; the greens especially so. Both courses were very playable and would suit golfers of all handicaps but without doubt to score well, you need to play some good golf. The staff in the clubhouse and proshop were all very welcoming with a ready smile and friendly conversation. When we checked in on the second day for our golf we were down to play the Torrance course again instead of the Kittock. The staff acknowledged it was their mistake and provided us with a buggy to start at the 10th as the 1st was busy all day. Not ideal but they could not have been more accommodating and helpful and later offered us discounted green fees when we return. Top class service. The hotel was first class too with a large bedroom with two double beds and an excellent bathroom. The choice of dining in the Hotel was reasonable. We ate in the Italian restaurant and the food was very good. As with all hotels of this class, the price of drinks and wine is a bit over the top but when it’s served by lovely staff with the right kind of attitude it helps take the pain away! 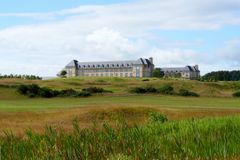 We would certainly stay at Fairmont St Andrews again and overall felt it was excellent value for money and the kind of venue ideally suitable for husbands and wives looking for a golf break. Thanks to YGT for your professionalism in organising the trip. I liked the text messages before and after our games wishing us well. Will speak to you soon about our next golf break. Regarding my trip to the Fairmont St. Andrews golf resort; it was fantastic from the moment we arrived until we left. We found the facility very easily and when we arrived our rooms were ready at 0930 rather than after 1500, as is the norm. The rooms were fantastic and the meals second to none. The steak pie at the club house is to die for and the price of a pint at £4.50 isn’t too bad for a 5 star golfing complex. The golf courses – the Torrance & Kittocks – were both absolute gems and from tee box to green, they were in fantastic condition. The members of staff at the hotel and the clubhouse were also very, very good. I will be booking to go back as my friends enjoyed it as much as I did. Our recent golf trip to Scotland was absolutely fabulous. It was a celebration of my 60 birthday with some of my closest friends and the entire long weekend was flawless. To get 16 grumpy middle aged men all to agree on anything is truly exceptional but there wasn't one dissenting voice in agreeing that this was one of the best golf trips they had been on. The Fairmont St Andrews Hotel was brilliant with large rooms, with 2 comfy double beds per room and overall the facilities were excellent with the bars staying open to silly o'clock every night we were there. The 4 courses we played were all in tip top condition and each had their own challenges to overcome. The Jewel of the tour for me was The Dukes course, which was both beautiful and challenging, closely followed by the Balcomie Links course which boasted stunning scenery and an exacting test of golf. Both had great club houses too. The 2 golf courses at Fairmont St Andrews were fairly similar in that they were both true links courses, with challenges coming from some truly awesome fairway and green side bunkers, as well as some serious rough! The views on some of the holes more than made up for the vast quantity of golf balls that disappeared into the long grass, never to be seen by man again! Again I would like to thank all at YGT who made this weekend a memorable one for all who attended. We had a great trip to Scotland and thought it was absolute top value for money. The Fairmont St Andrews hotel was magnificent, as were the golf courses, both of which were in first class condition, with the Kittocks being our favourite of the two. We basically had both courses to ourselves so the clubhouse was very quiet. The pro was very helpful and friendly. Food and drink was a bit pricey but the 5* environment in the hotel was great and I would recommend this golf break to anyone - 10 /10 trip. YGT service was very good too and I would have no problem in recommending your company to my buddies. Found the Torrance the easier of the 2 courses at Fairmont, although every bit as challenging as the kittocks it benefits from more weather shielding being more inland for a good proportion of the course, making a front 9 loop around the hotel it then heads out towards the coastline, I found an approach to one slightly raised green particularly arresting, as you reach the green the flag is framed by a parting of the gorse bushes behind revealing a view accross the bay and St Andrews bathed in sunshine leaves a lasting impression of being in the home of golf, the course was as good if not better than we hoped for, a real golf course and true test of shot making with game management a must. I would not have liked to play the course in anything more than the 12 mph winds we played in, played in late March when the rough was dormant so finding an errant ball though difficult was possible, the fairways and greens were pure and manicured, the views constantly distract but in a good way, when you're playing an approach into a green that appears to be sat on the edge of a cliff with nothing but sea as a backdrop, it certainly focuses your attention. Will be back for sure. this day the weather was good but the golfers in front of us were very slow so this today it took longer excellent course my partner would definitely go again fantastic weekend could not fault it. Really nice course that makes you think of shots. Wayward shots will be punished with thick rough and even fairway shots weren't guaranteed to be safe with strategic bunker positions. The views at the course were breathtaking as well. Great course with condition of greens were excellent slow play as alot of people were out which we didnt mind.